Learn the basics of Showbie here! Showbie is an app used by teachers to assign, collect, and review student work. Showbie keeps student work organized by classes and assignments. 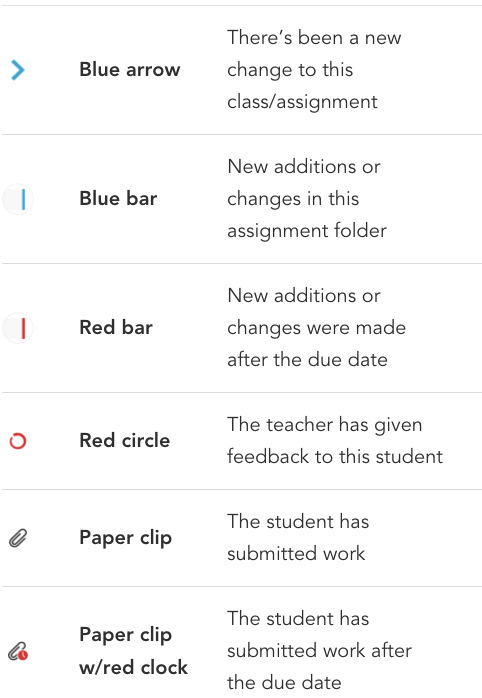 At a glance, students can see their upcoming assignments and due dates so they can prioritize their work. Students can provide responses to assignments or annotate worksheets directly in the app in the form of text comments, the pen tool (which allows them to draw and write directly on the page) and pinned voice notes. They can also submit work to Showbie from virtually any other app, with some of the most popular being iMovie and Book Creator. Likewise, teachers can provide grades as well as rich feedback in the form of voice notes, annotations, and videos. Example Assignment. Here, Ms. Hansen is a teacher. She uploads the Butterfly Lifecycle and the instructions in Shared Items so that all her students (left) have a copy of it. It looks like Ms. Hansen has already graded some of the students' work (yellow bubble). Now she's just waiting for the rest of the students to upload their work. Teachers and students can always see what’s new in their classes and assignments. When you notice a blue arrow strip next to an item in Showbie, it means something has been added or changed. Icons appear throughout Showbie to provide useful information. For example, the paper clip indicates work submitted by the student while the red clock shows up indicating when an assignment has been submitted late. View the full guide on Showbie Symbols. Students have their own personal portfolio that showcases examples of their best work from any of their classes and assignments, either curated themselves or by their teacher. Portfolios are a great way for students to reflect on their previous work, and they’re an easy way to keep parents updated! Learn more about what parents can access in Showbie. Example Portfolio. This is Christy Young’s Portfolio where she can keep track of her best work. Ms. Hansen has some feedback for Christy on her Water Molecules assignment (in the form of a voice note). It also looks like Christy did very well on her Term Paper with Ms. Hansen giving her a grade of A. Well done, Christy! Ready to start using Showbie? Sign up for Showbie as a teacher, student, or parent! As a teacher, students join your class by using the class code. Here’s how you can add students. Students! Your teacher may already have some work for you. Use this guide to learn how to join a class. For parents, you need to ask your student’s teacher for a student code. Afterwards, you can enter the code to see their work. Check out this guide on how to add students.